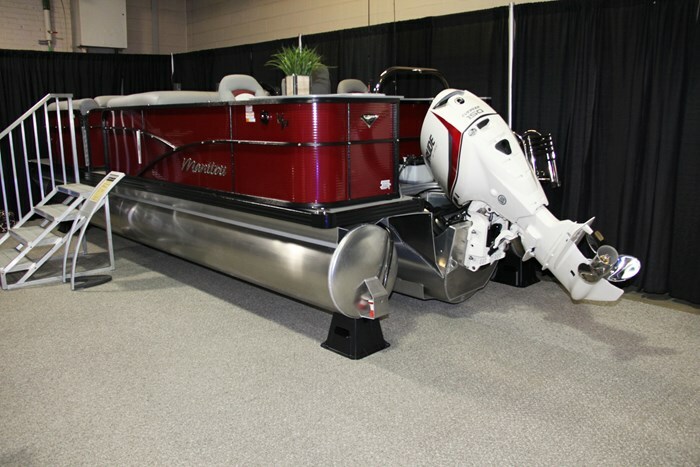 The Aurora Angler LE series is one of twelve series and dozens of models offered by Manitou for 2019. 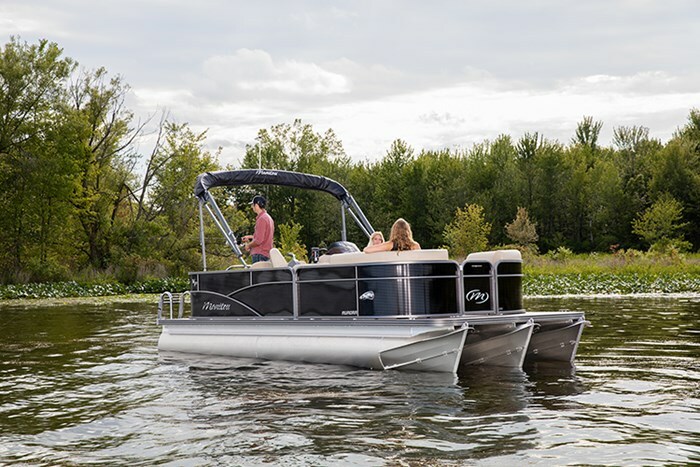 The Aurora Angler LE series is available in two sizes; twenty and twenty-two feet and two floorplan configurations; the Standard and the Full Front, thus four different models. The “LE” designation in the series name refers to an L-shaped couch within the portside aft section of the deck. 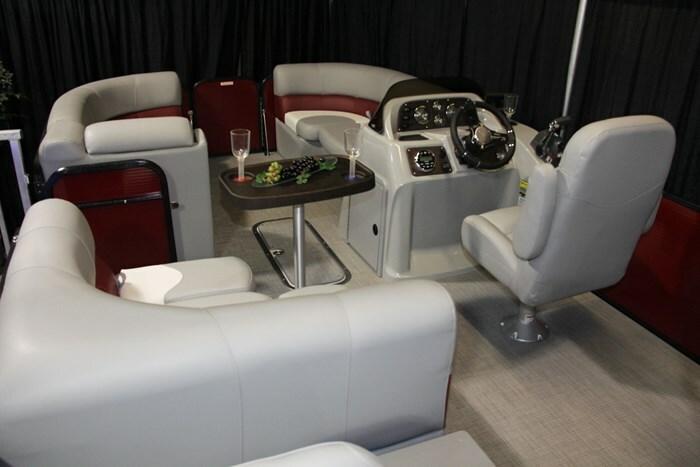 The Full Front configuration is identical in layout and size to the Standard configuration from the driver’s console aft but the bow area of the Full Front has a pair of facing couches. 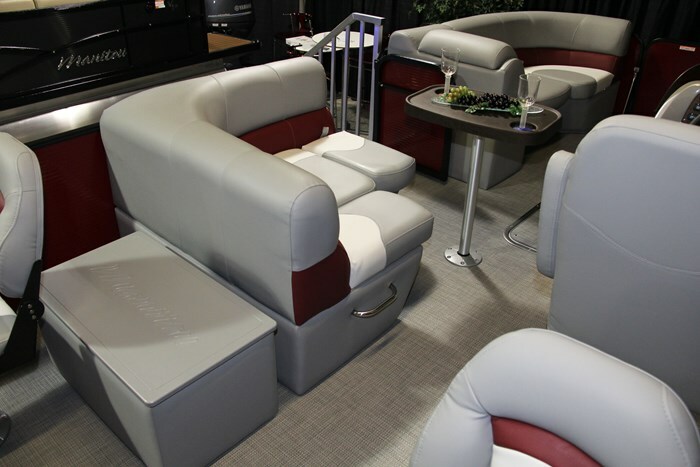 Only the length of these couches varies with the two-foot difference in the length of the boats. All else remains the same. Manitou refers to this as its “Value Fishing” series. Even though it is called a “22,” it could easily be called a twenty-three footer and it comes standard with a pair of twenty-three inch diameter tubes rated for a maximum of 90 horsepower. You may optionally choose a pair of twenty-five inch diameter tubes to raise the horsepower rating to 115. A center third tube may be added to the 23-inch diameter outer tubes. The most economical center tube choice is the twenty-seven inch VP tube. This choice ups your horsepower rating to 150. Your final choice is to add the center twenty-seven inch SHP (Sports Handling Package) tube and the horsepower rating raises to 250. The addition of a third centre tube increases the fuel capacity from 24 to 43 (US) gallons. On the portside of the deck aft of the center entry gate is a comfortable two-person L-shaped lounge aft of which is a swivel fishing chair on a pedestal. An identical swivel fishing chair is on the starboard side mounted just ahead of the stern entry gate. In the stern fence just ahead of the motor well are vertical rod holders and a livewell cabinet with storage is standard. A tackle box is optionally available. The starboard side stern platform features a four-step boarding ladder. Just ahead of center on the starboard side is the fibreglass driver’s console with windscreen. Facing this console is the driver’s standard low back adjustable reclining helm chair with slider. A tilt wheel with Teleflex Xtreme steering is standard. Instrumentation includes tachometer, speedometer, fuel, and trim gauges. Also standard is a 12-volt outlet, a USB port plus a Kicker KMC1 Bluetooth-compatible stereo with four speakers. The bow area features a pair of three-person facing lounging couches. 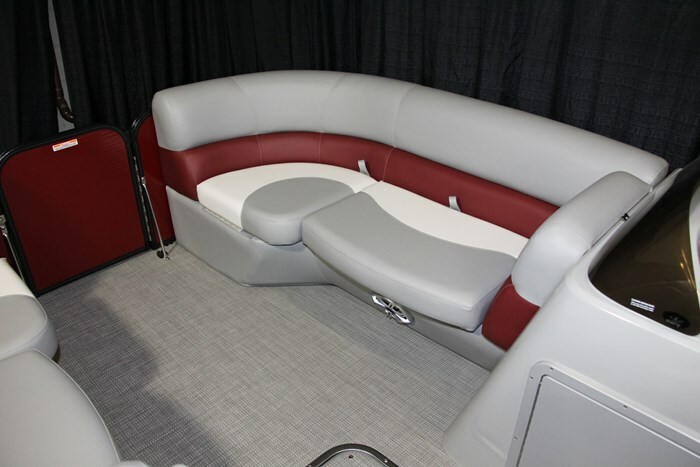 All furniture is of Roto-molded construction utilizing Matrix Marine vinyl upholstery with storage beneath all seat cushions. 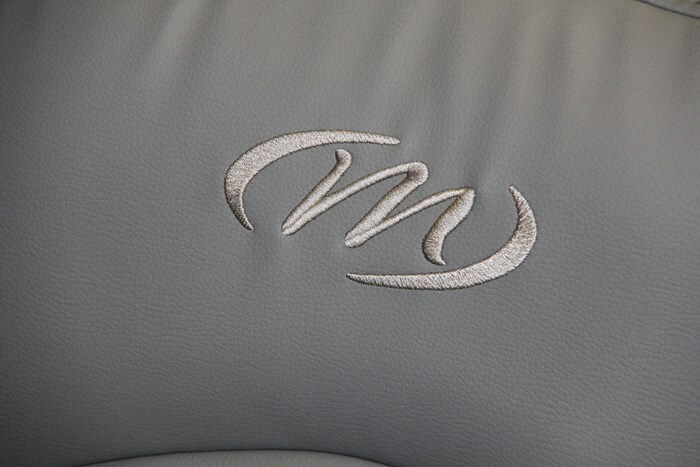 There are twelve combinations of two-tone upholstery colours from which to choose. Vinyl flooring is standard and you have a total of thirteen flooring choices. You may also choose from nine exterior colours, and three choices of optional powder coated rail colours. 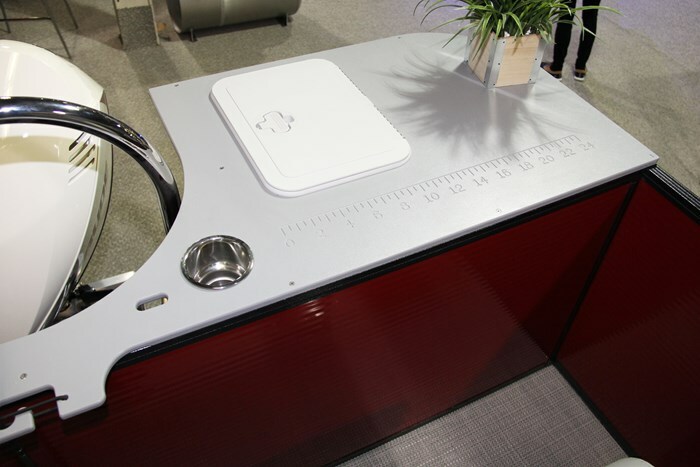 A colour-matched bimini top with boot plus mooring cover are standard. 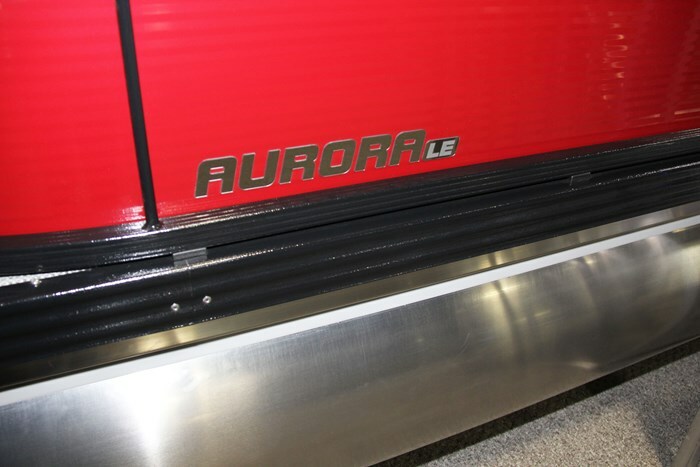 Upgrading your 22 Aurora Angler LE Full Front with available options will be fun to create exactly the boat you want to match your boating lifestyle. A bow gate filler bench will create full U-shaped seating in the bow area. 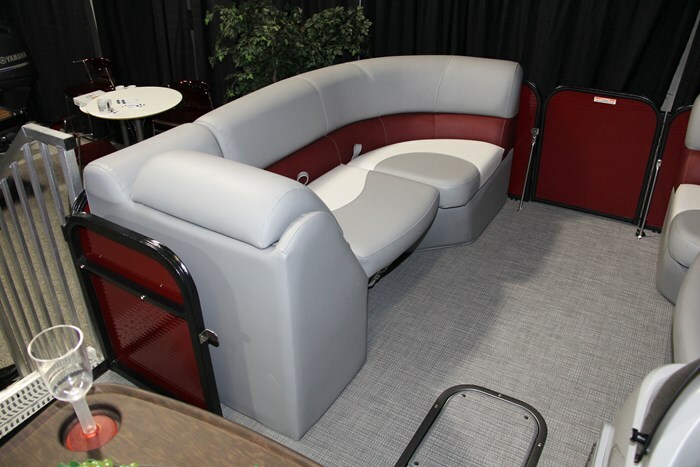 Add a dinette table floor-mounted between the bow couches and further add a portable cupholder unit plus an ottoman. If you like lighting, add interior and/or exterior blue LED track lighting, cupholder lighting, and even pedestal lighting and table base lighting. LED docking lights are also available. Both a soft-sided cooler and an Orion 45 Super Cooler are available as is a rail-mounted barbeque. A centre tube allows you to further choose a most useful in-floor storage compartment suitable for watersports accessories. 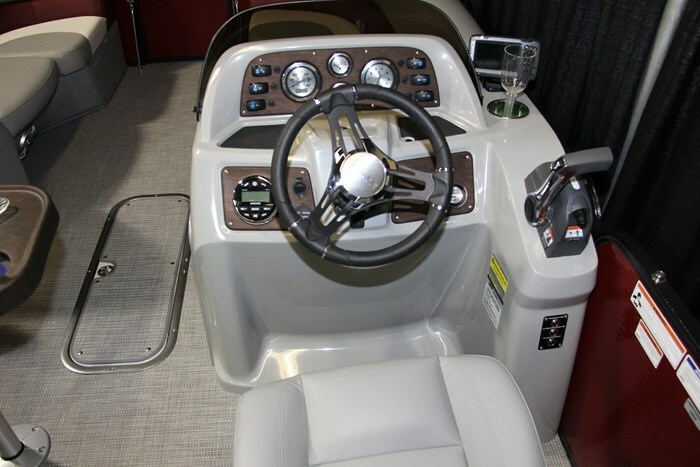 At the helm, you may upgrade the captain’s chair to a mid-back or high-back recliner with slider. Add an in-dash hour meter and/or depthfinder and a pod-mount Lowrance Hook 2-4X fishfinder or Hook 2-5 GPS/fishfinder with speedometer and water temperature readouts. 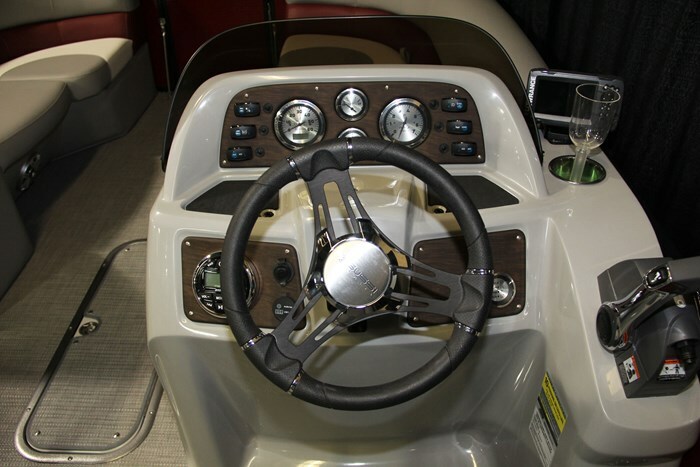 Upgrade to an Oasis sporty steering wheel along with power assist steering and Seastar hydraulic steering. Sound aficionados may upgrade to a Deluxe Kicker stereo with or without upgraded amplifier and subwoofer and upgraded speakers. You could go all out to a Premium JL stereo system and add LED lighting to all choices of speakers. For greater family recreational enjoyment, choose the hybrid tower with lights, a ski tow bar, ski mirror, and upgraded Versa-Trac boarding ladder. 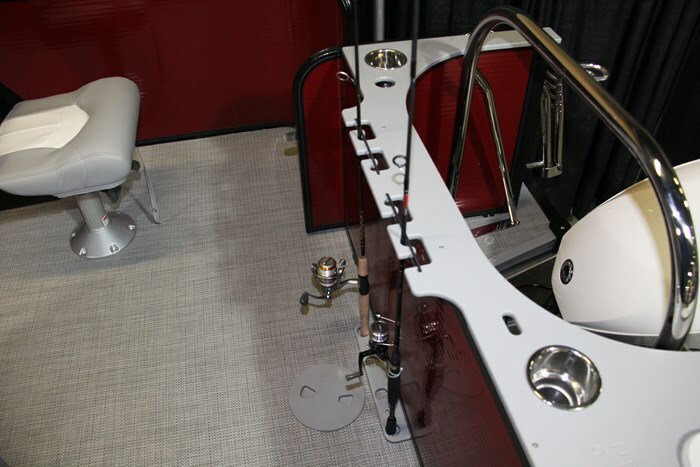 You may also choose a double bimini top with or without LED lighting or a power arm for the bimini. Whether for fishing or for recreational family enjoyment, the Manitou 22 Aurora Angler LE Full Front certainly caters to all comers.